Lets use up those lolly sticks to make a DIY flower vase! Ice cream stick crafts are fun to do with kids and you can make something to use around the home like a flower vase. 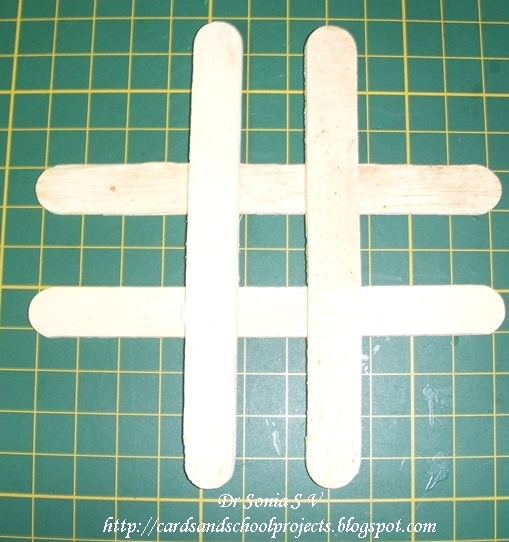 Make a cross with 4 ice cream sticks as shown. She thoroughly enjoyed making this flower vase! Invert and stick one on top of the other an you have a lovely Popsicle stick flower vase. You can layer more such vases and stick them together to make a tall vase.have fun with this simple craft idea. Do leave me your comments. 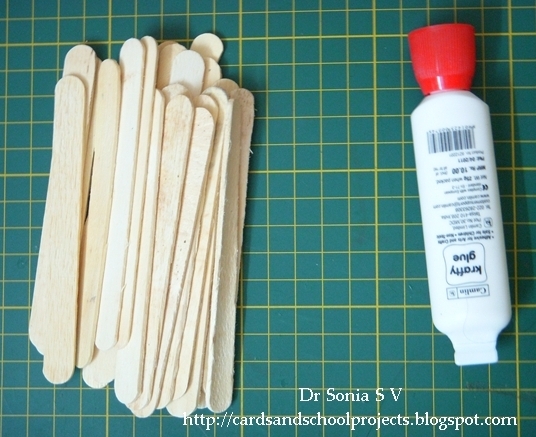 wow this is so simple yet so attractive your daughter is soon becoming a pro at crafting. Lovely, the flowers look great sitting in the vase!!!! Thank You Lisa her red dress is one of her favorites! Thank You Hussena yes its a simple and quick craft only we have to give it enough time to dry! Fun & pretty craft project. Your daughter is adorable looking & great to have her crafting early and enjoying what she is doing. Yellow Roses are a fav color of Rose of mine. Doc this is awesome.. Can I like borrow this idea and do it for the next class at my kid's work shop next week??? I bet there will be a lot of people going out and buying bags of the sticks just so they can make the beautiful vase. 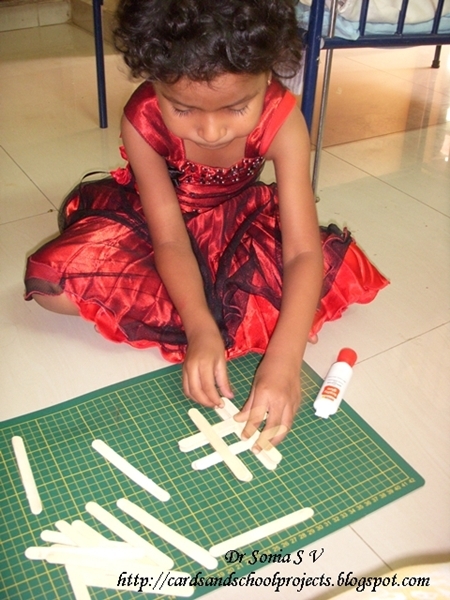 Your little one is adorable and such a budding crafter. Beautiful flower vase! Thanks for sharing this. 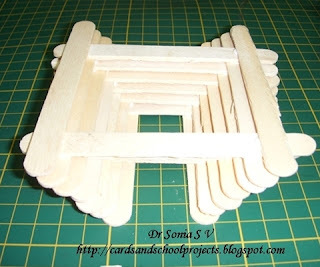 Very clever and what a fun project to do with the children. Such a fun project! Nice work! Thank You Dear friends for cheering me up with your comments! Khush you are welcome to borrow any idea of mine dear! This one is easy to do with kids and comes out looking super.You can also encourage your students to paint or embellish it. 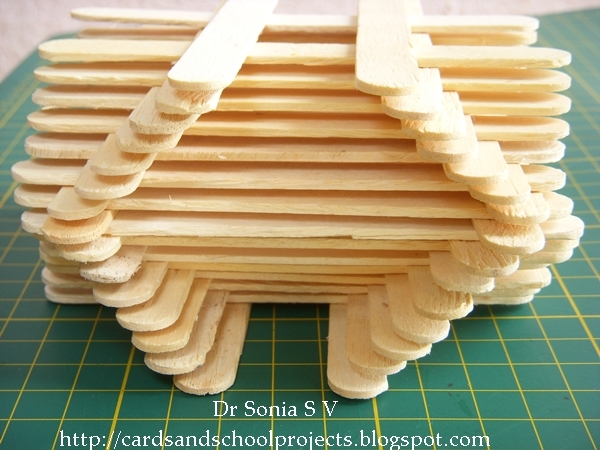 This is a great way to use up those lolly sticks. Thank You Amy for dropping in. Yeah its my little ones fav dress-- its so worn out by frequent use that now I allow her to craft in it! Pam I am making up for years spent with my head buried in books! Так оригинально! Классно получилось! Идея просто супер!!! 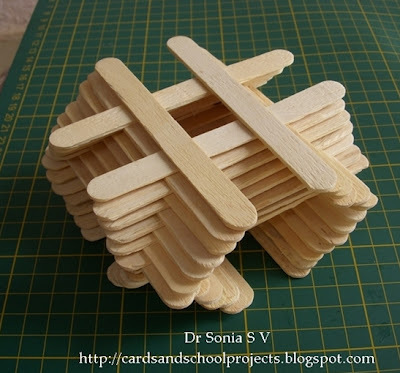 I can remember making things at school out of these sticks and we loved it! Fabulous Sonia! I made a similar project when I was a kid so I can very well imagine your daughter's interest and excitement! Well ET it was the first time I was doing it too so I should say both mum and daughter were pretty thrilled with our lolly stick vase! Loved it. Reminded me of my school days. We used to make so many things out of using Popsicle sticks. 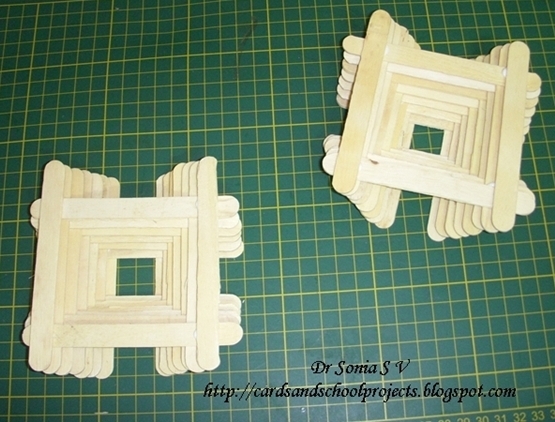 Once my younger sister made a bridge out of these as a participating exhibit for a competition for structural design at IIT Delhi. Its fun how much can be created with simple things. Well done!...and it's wonderful you're passing your love of crafting on! Great idea!!! wonderful creation and adorable cutie.meanwhile i can't stay idle ,when i'm cooking (tht too waiting for the final boiling)will be doing something or other ....cleaning ,washing utensils...drawing too...:):):)talking tooo...chatterbox. Practical stylish and easy to do. The picture of your daughter is great! She looks so proud! Thanks for sharing your talent. Deanne so glad you stopped by and gave encouragement on our Popsicle craft. Dr. Sonia, thank you so much for giving me that sweet award! You are amazing! I love this vase and it would be something fun for me to make with my grandsons. Thanks for sharing your wonderful creations with us! Thank you for the kind comments about my parchment work. I have only just restarted as I had been suffering from carple tunnel, but as that seems OK I can make more parchment projects. I love your blog. Your tutorials are brilliant and I love the pics of your daughter. So nice to have one still young enough to enjoy crafting with you. Mine daughter is 26 and away from home. 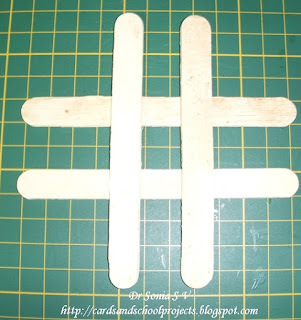 I love using these sticks... :) I remember making a lamp shade & a bird house in school vacations :) Its amazing to see how even the next gen loves making stuff from these things..
Great project. Looks like fun to make from the smiles from your daughter. 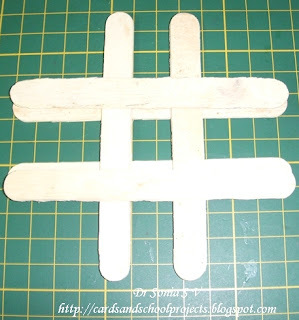 Kishley an ice cream stick bird house would have looked fab! I wish I could have seen it! Just found your blog via Terry at Crafters Delight. Love your tutorials for the squash box and purse with the insert. Very clear and easy to follow. Thankyou. Have now bcome a follower too so I won't miss any more inspirational makes. Oh what a fun project!!! I remember making a bowl with popsicle sticks when I was a child. I did it at summer camp. I know you daughter just loves her finished product! She is BEAUTIFUL and her dress is GORGEOUS!! 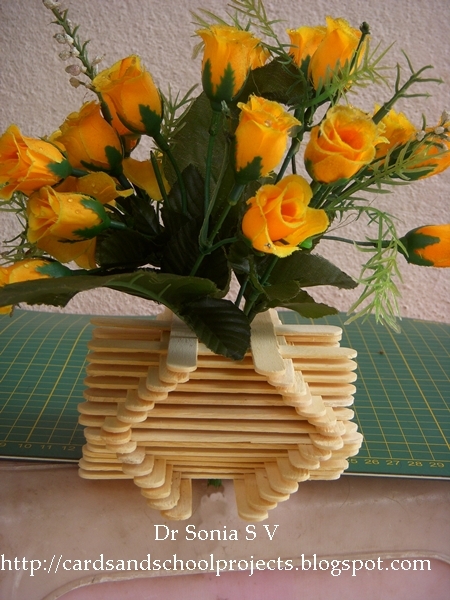 What a great flower vase with the popsicle sticks. Lovely flowers, too. It is just wonderful to have your daughter enjoying crafting with you. WOW, what a brilliant idea! 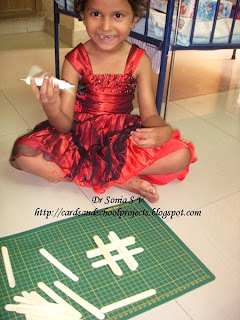 Your little crafter is adorable! :) Love this a lot. Ur daughter looks so excited and its such a simple yet fun thing to do ! wow..this is cool, may be color it according to decor or glue some bids etc..
and thanx fer such a sweet comment .. i can help u in making stuff of my style aka vintage .. believe me its bad .. i end up making vintage everytime ! This is amazing...Great to see ur cute lil crafter doing wonders! This is such a great project for the little assistants! Prisha did a fabulous job and I love her dress! My girls love their dresses too although they also go through several wardrobe changes a day! Thanks for sharing this fun one! Have a good day! Just checking in, back from vacation! I love, love this idea and obviously your daughter does too! Such a beautiful little girl. Isn't it great to have such a helper!!! What a wonderful idea! I imagine how much your daughter must have enjoyed it! :)You're an inspiration! Doc...loved all ur work. can u tell me where in Banagalore can u get all thsw lovely paper and punchcraft material and glue gun from?? PS: most of the time I use stationary store locally made paper- I work with what I get! This is such a great kids project of making flower vases out of popsickle sticks. Nice wonderful project. Good team work. Sonia, Your Daughter is so pretty and what a lovely red dress. I can see she is enjoying crafting and what a great idea and such a eye catching Vase, I have a load of these sticks gues what I am now off to do. Thank you for sharing the idea and for your comment on my blog. Thank You so much. Loved your blog too! Your flower vase from icecream stick is very beautifully made. I will let you know once i complete. The quality of stick is also very good. Please tell me where do you buy your craft product. I want the contact details. I try in making this vase .It came out well.Thank you. Thats awesome Meena. I noticed you have a blog. Do share pictures!